These days, sweet corn has become a regular item in our weekly veggies list. Somehow we are using it regularly in the form of snack, soup or salads. 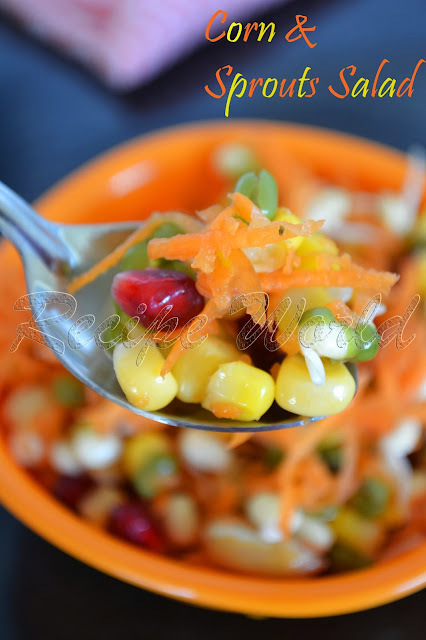 Both sweet corn and sprouted groundnuts make a nice combo with all the sprouts and vegetables. I usually prepare different salads using both of these along with different sprouts and vegetables. 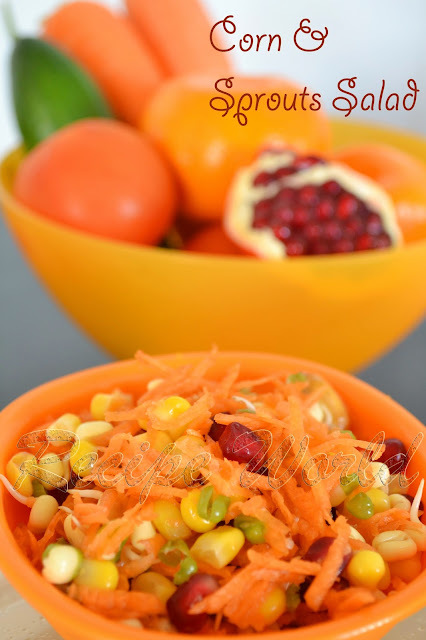 Combine the sprouts, sweet corn, pomegranate and grated carrot in a mixing bowl. Sprinkle some salt on the top and mix it well. Add a pinch of pepper powder if you desire. Transfer the salad mixture to a serving bowl and enjoy! You can make some variations to this salad using different veggies or sprouts of your like.